Valley coach Nolan Crabtree discusses a lineup change during Monday’s 5-0 loss to Piketon at VA Memorial Stadium. 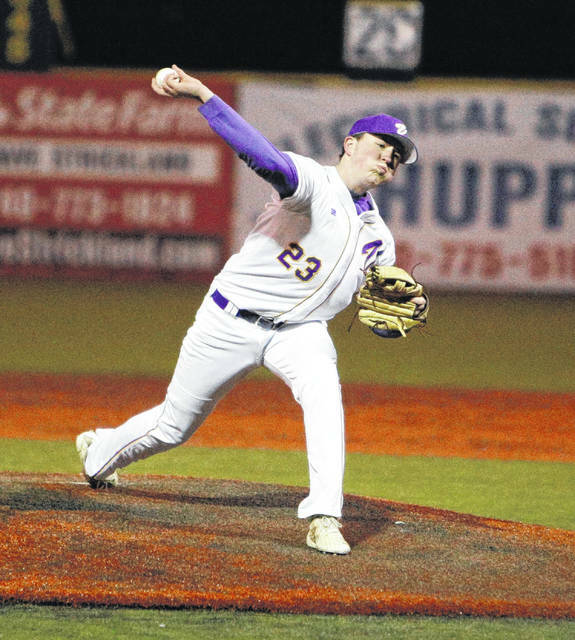 Valley’s Devin Wiley throws a pitch during the later innings of Monday’s 5-0 loss to Piketon at VA Memorial Stadium. Valley senior Tanner Cunningham gets ready to swing at a pitch during Monday’s 5-0 loss to Piketon at VA Memorial Stadium. CHILLICOTHE — On a night where the air was as cool as its bats, Valley’s baseball program suffered its first loss of the season Monday at the hands of Piketon. 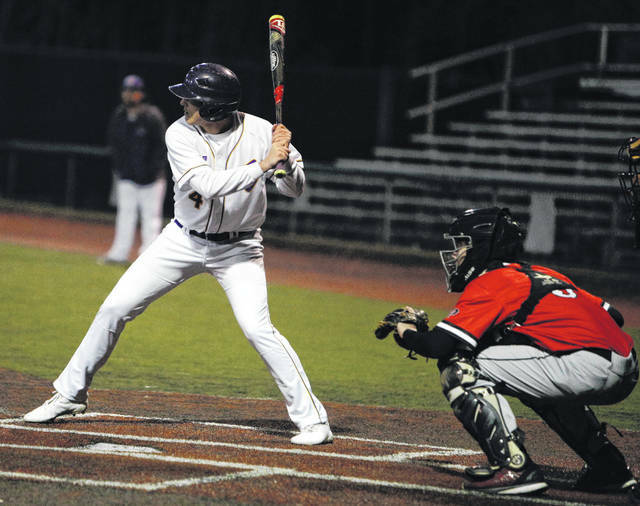 Playing in the First National Bank First Pitch Classic at VA Memorial Stadium, the Indians (1-1) fell by a 5-0 final — coming after Saturday’s season-opening 3-2 win over Colonel Crawford. From the get go, Piketon starting pitcher Jacob Mathews had Valley off-balance. The junior struck out eight of the first nine hitters he faced. The Indians finished the night with just one hit, coming thanks to Jesse Jones, who broke up a no-hitter in the bottom of the fourth inning. Valley’s Jared Morrow took the loss on the hill, throwing four innings and giving up five earned runs on eight hits. However, four of those runs came in the third inning alone. Take away the four-run frame and, overall, Morrow threw a decent ballgame … but it still wouldn’t have mattered as his offense had an off night. Evan McGuire got the Redstreaks (2-0) on the board with an RBI single in the second inning. Then, in the third, Piketon pieced together a two-out rally that featured an RBI triple from Easton Lansing, another RBI single from McGuire, and a walk and a hit batter with the bases juiced. Mathews’ pitching line ended at 4 ⅓ innings of one-hit, eight-strikeout baseball. Lansing finished 2-for-4 with a triple, a run and an RBI, McGuire was 2-for-4 with a run and two RBIs, and Paul McGaughey ended the evening 1-for-3 with two runs. Jones was 1-for-3 for Valley while Morrow and Andrew Andronis drew walks to reach base. Valley, a defending Division III district champion has work to do. But Tuesday’s loss isn’t the end of the world. The Indians get back to action Tuesday evening, hosting Portsmouth. 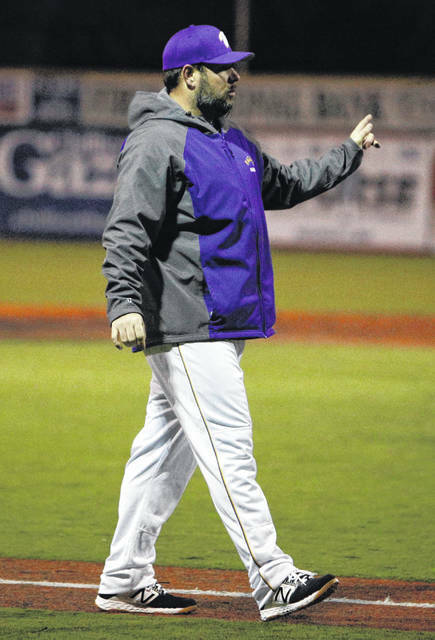 https://www.portsmouth-dailytimes.com/wp-content/uploads/sites/28/2019/03/web1__MG_0550-3.jpegValley coach Nolan Crabtree discusses a lineup change during Monday’s 5-0 loss to Piketon at VA Memorial Stadium. https://www.portsmouth-dailytimes.com/wp-content/uploads/sites/28/2019/03/web1__MG_0561-3.jpegValley’s Devin Wiley throws a pitch during the later innings of Monday’s 5-0 loss to Piketon at VA Memorial Stadium. https://www.portsmouth-dailytimes.com/wp-content/uploads/sites/28/2019/03/web1__MG_0534-3.jpegValley senior Tanner Cunningham gets ready to swing at a pitch during Monday’s 5-0 loss to Piketon at VA Memorial Stadium.